SCENE: Top of the 8th, Texas Rangers at the Boston Red Sox. 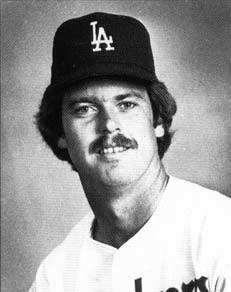 Your ESPN Wednesday Night Baseball announcers are Rick Sutcliffe and Dave O'Brien. Dave: The Boston Red Sox have scored 27 runs in the first two nights of this series. The difference is tonight they are getting serious pitching from Jon Lester, as they have all season long. The man who has tossed a no-hitter after winning a World Series Game last year, and who has really put himself on the precipice of becoming a real star in the American league, amongst starting pitchers. Dave: Right on—right on the edge, the precipice. Seven innings pitched for his seventh consecutive start. So he's been money for Boston, the 24-year-old from Tacoma. What are you doing? Dave: Foul. What is this? Oh, it's the thesaurus. Rick: You know it was my daughter that graduated from Harvard, not me. Rick: She was kind enough to get me one of these (holds cover of pocket Webster's New World Thesaurus up to camera) so I can keep up with you. Dave: She—she got that great intellect somewhere. Rick: (laughs) I tell everybody she got her good looks from her mom, because obviously I kept mine, and everybody reacts just like you do. Dave: That's a line that, that you never manage to wear out. I don't know how you do it. Rick: The [ESPN production] truck is cracking up right now. That's not funny! Dave: I've met your lovely wife Robin. Rick: (staring into camera) And I will be in the truck when the game's over with. Rick: Oh yeah. "Come and get me." You hear that? Dave: You must be feeling better. That's a good sign. Lined to right-center field, backing up J.D. Drew. Metcalf is gone. One man gone as we go back to the studio. Dave: Thank you very much. Here's Ian Kinsler. A quiet night for him so far. Outta character. He's flied out, grounded out, struck out. Softly hit, Lowrie to charge it, but a foul ball just off the line. Kinsler hitting .320 coming into play tonight. He has 99 runs scored to lead the American league, 159 hits. But he is suddenly tied in the hits column with Dustin Pedroia. Rick: That's not a word. Dave: It's—it's in there. Go ahead and take a look. Trust me, it's in there. Rick: (looking in thesaurus) I got "press." I got "pretend"
Dave: Your daughter Shelby's in the booth. Is Shelby here? Rick: Make it a lot easier to have her here. Dave: (muttering) They use those words at Harvard. (pause) All the time. Rick: Is it like "press," like... like "pressu—"? Rick: Oh, I'm where the S's are. (mutters) Oh. Rick: You know what? It's not in here, which tells me that they probably think it's, you know, such a common word that everybody... I'm getting myself in more trouble. Dave: Herelemme—lemme take a look at that. I'll take a look. See if we can find it here. Kinsler backs away. Rick: I'll do a little play-by-play. Dave: Fire away, brother. I'll just see if I can find it. Rick: Lester falling behind here. (aside, to O'Brien) You know, I did that one time. I never got asked to do play-by-play again. Dave: Well, sorry about that. Rick: ONE OUT! Jon Lester on the mound, here comes the three-one pitch—TAKES! it on the outside corner, count's full. Rick: When you only gotta do one hitter... it's not that tough. This crowd is really getting into it now; we gotta little wave goin' on. I toldya, that word's not in there. Dave: It's—it's not in here. Rick: You know, I question a lotta—oops. Rick: It's your fault. YOU cost him the shutout. Give me my book back. They went on for a while after that, and "precipice" made a curtain call, but that's the gist of it. I've long since accepted that the average baseball announcer will have a below-average vocabulary and talk about God only knows what during the game, but this was just outstanding. First, almost all discussion of the game went out the window. They lost focus so completely — including repeated booth shots from the camera — that you just knew something like a home run was coming, almost as if Fate demanded someone pay attention to the goddamned game. Second, you have a guy who not only doesn't know the meaning of precipice, he also doesn't think it's actually a word. And third, the allegedly "smart" guy in the booth misuses it horribly. Precipice? Really? The word basically means cliff. Most people have never been on the cliff of success. You know who spends a lot of time on cliffs? Wile E. Coyote. When you want to indicate that a player improves his game steadily and will soon be on a higher level of excellence, maybe you don't want to bring in a metaphor that involves imminent danger of plummeting to the ground. I mean, Wile E. is eternally on the precipice of having dinner, usually just before landing on the valley floor and holding up a small "EEP" sign as the boulder he was previously pushing hurtles downward toward a sudden reunion with him. Maybe that kind of perennially doomed character isn't someone you want to associate with a guy who just overcame cancer. Or maybe I need to be more imaginative when people start dropping words like "precipice," instead of running back to Warner Brothers for analysis. The cruel irony, besides the fact that these people are paid to use English at people, is that the multiple uses of "precipice" could have been avoided if Sutcliffe's daughter had bought her father a better thesaurus.